Vadym Troyan to fill in for Dekanoidze. The head of the National Police Khatia Dekanoidze decided to resign, she announced at a press briefing on Monday, 14 November. "My dear Ukrainians, my own Ukrainians! Within my powers, in a year, as I have promised, I have laid the foundation for the development of the new National Police and remained faithful to you and your interests until the last minute on my job. Unfortunately, my powers and my will for change proved to be too limited to ensure drastic changes My job is done, and I therefore declare my resignation," Dekanoidze said. She recalled that during the year of her tenure she managed to conduct certification of police officers, an independent recruitment center was set up, the formation of the patrol police was completed, an internal security department and a directorate for protection of human rights were created in the national police. Finally, she said that under her leadership, a system of transparent job contests for investigators, district police chiefs and operative officers. At the same time, Dekanoidze acknowledged that it was proved to impossible to overcome corruption in the police within a year's term. Dekanoidze stressed that the National Police requires decent funding to be effective. She also insisted on the need to reform the prosecutor's office and courts. The practice of intervention of politicians and officials in the work of the National Police must be stopped, she said. "I hope that the work I have done will give impetus to further development of the National Police and the creation of a new country. If there is political will," Dekanoidze said. 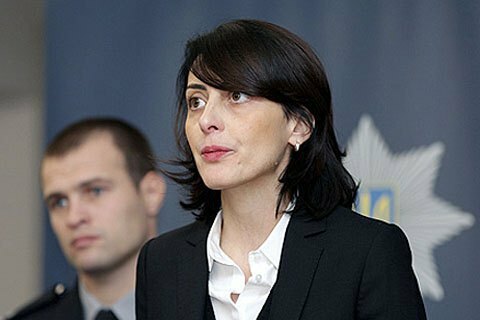 In the near future, Dekanoidze's deputy Vadym Troyan will fill in for her as acting chief of police. Dekanoidze headed by the National Police of Ukraine in November 2015. Before that, she for a few months has been an adviser to Interior Minister Arsen Avakov. Prior to coming to Ukraine from Georgia, she worked as the rector of the Police Academy of the Interior Ministry of Georgia, and Director of the National Examination Center of the Ministry of Education and Science of Georgia. In the period from July to October 2012 she was the Minister of Education and Science of Georgia, and left the post in connection with the resignation of the government of Merabishvili. Vadym Troyan was appointed the first deputy head of the National Police of Ukraine in March 2016. When the war in Donbas broke out, he was the deputy commander of the Azov volunteer battalion. From October 2014 to March 2016 he headed first the militia and then the police if Kyiv region.